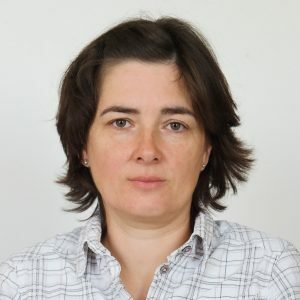 Research Interests: fungal diseases of woody plants, biological control, mycology, diversity and distribution of pathogens, plant protection. Current research interest: chestnut blight disease, Dothistroma needle blight, ash dieback. Acta Horticulturae, 1220 , pp. 87-94, 2018, ISSN: 05677572. 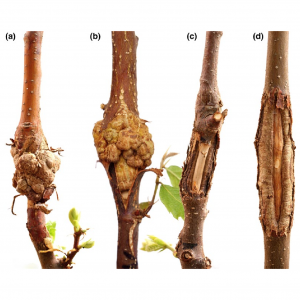 Five chestnut trees (three hybrids Castanea sativa × C. crenata, one C. sativa and one C. crenata) with different levels of blight resistance were subjected to the screening by two virulent and one hypovirulent strains of Cryphonectria parasitica in order to examine reliability of ex situ tests for grading of blight resistance in chestnut. Branches 2-3 cm in diameter were harvested from the trees, in early April and end of September and stored at about 10°C for either 2 weeks (for branch sections) or 4 weeks (for bark- and wood-tissue sections). Branch sections and bark- and wood-tissue sections were inoculated with the C. parasitica strains and incubated in the dark at 25°C with 95% humidity for 4 weeks and/or 4 days, respectively. In branch sections, superficial cankers were very rare so only occurrence of pycnidia formed around the inoculating holes were evaluated. Pycnidia occurred more frequently in branch sections collected from the less resistant accessions in October trial. The size of necrotic areas reflected the resistance ranking of accessions in April/May better than in October inoculation trials. 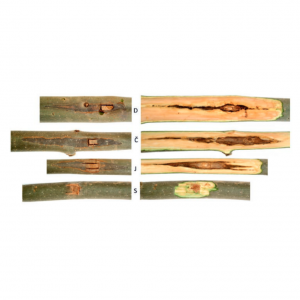 Results of inoculations on excised wood tissue were more consistent with the real blight resistance level than data obtained from inoculations on excised bark tissue. Occasional inconsistence between results of inoculations carried out at different dates or in different trees might be caused by different physiological state of collected branches. Based on these results it can be concluded that the end of dormant period seems to be the most suitable time to carry out both pathogenicity and resistance tests in chestnuts. Journal of Plant Protection Research, 58 (3), pp. 227-233, 2018, ISSN: 1427-4345.
formed in F. angustifolia than in F. excelsior. Some clones exhibiting some resistance to the pathogen were identified. Forest Pathology, 48 (5), pp. e12439, 2018, ISSN: 1439-0329. 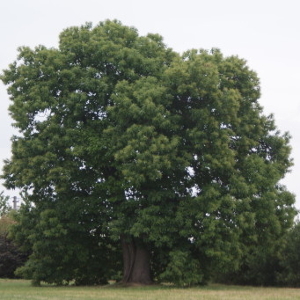 The possibility of screening young seedlings of Castanea for chestnut blight resistance was examined to try to shorten time needed for a breeding programme. Two-year-old chestnut seedlings of eight progenies, derived from open and controlled pollination of three hybrids (Castanea sativa × C. crenata and a C. crenata tree by paternal tree of C. sativa) were screened for resistance to chestnut blight. One hybrid and a C. crenata were partially susceptible, and two hybrids were partially resistant to chestnut blight. A total of 179 seedlings were inoculated with two virulent and one hypovirulent strain of Cryphonectria parasitica at two dates (early June and early September). Stromata production was higher and canker size larger when seedlings were inoculated in early June. Differences in canker size among seedlings derived from different parental trees were observed only after September inoculation. However, differences in canker size among seedlings inoculated with the virulent strains were observed only after June inoculation. The only significant effect on seedling survival was based on fungal strains used for inoculation. Ratio of seedlings, which died after inoculation with the hypovirulent strain, was significantly lower (36.8%) than those that died after inoculation with virulent strains (88.4 and 95.1%). Survival of seedlings was affected only by fungal strains used in inoculation, and not influenced by parental trees. The risk of seedling dieback increased with increasing canker size and with decreasing stem diameter of seedlings. Persoonia, 40 , pp. 240-393, 2018, ISSN: 1878-9080. Mycological Progress, 17 (9), pp. 1097-1111, 2018, ISSN: ISSN: 1861-8952 . Phylogenetic reconstruction of Hodophilus species with a yellow colour on the stipe based on nrITS, nrLSU and rpb2 sequences revealed six European species. All these species correspond to the widely accepted European concept of a single species Hodophilus micaceus. Four of these species are described and illustrated. H. micaceus and H. phaeoxanthus are recognised as two separate species and H. albofloccipes as a synonym of the latter. Two species, H. anatinus and H. cambriensis, are described as new. Possible endemism of H. micaceus and H. cambriensis to the British Isles is discussed. All analysed North American samples represent different species to those found in Europe. The North American species Hygrophorus rugulosus is combined in the genus Hodophilus. The preliminary key uses position and development of the yellow colour during maturation as themost important distinguishing character.The presence of the yellow colour is discussed as a possible synapomorphic character. 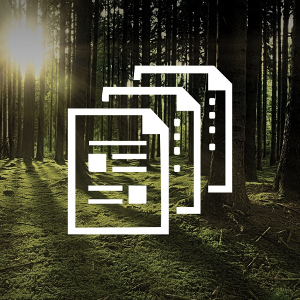 Scandinavian Journal of Forest Research, 33 (7), pp. 650-656, 2018, ISSN: 1651-1891. Slovakia. 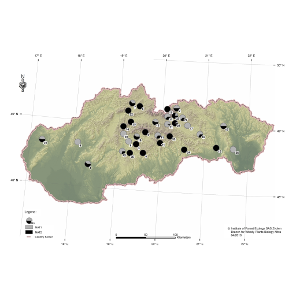 Here, we report the detection of Dothistroma pini at six localities around Slovakia, representing different plantation types. Four pine species (Pinus sylvestris, P. nigra, P. mugo and P. jeffreyi) were confirmed as hosts of D. pini in Slovakia, of which only P. mugo has been previously reported as host in Slovakia. Three gene regions (ITS, EF1 –α, and ß-tubulin) of each of the 13 isolates were sequenced and assigned as D. pini. Based on ITS sequences, the studied isolates represent the haplotypes Dp_HAP.1, Dp_HAP.2. Both mating types were detected but at different localities. Our results suggest that in addition to D. septosporum, D. pini may contribute to DNB also in Slovakia. Forest Pathology, 48 (3), pp. e12421, 2018, ISSN: 1437-4781. The occurrence and distribution of Dothistroma needle blight (DNB) were studied in 2014–2017 around Slovakia. A total of 84 localities, both native and planted, were investigated, and the presence of DNB was confirmed in 73 of them. In all positive locations, symptoms typical of DNB were observed and the Dothistroma species was confirmed using species-specific primers either from fungal cultures or directly from needles. Both Dothistroma species—D. septosporum and D. pini—were identified. Both species occurred together in 29 locations, only D. septosporum in 42 and only D. pini in two locations. The host range of D. septosporum included 10 pine species and two spruce species. The host range of D. pini comprised the same number of pine hosts but only one spruce species. Five pine hosts, P. aristata, P. coulteri, P. densiflora, P. jeffreyi, P. × schwerinii, and one spruce host P. abies are new hosts species of D. pini. P. densiflora and Picea pungens have earlier been reported to be susceptible for DNB. In this study, D. septosporum was found from both tree species. Phytotaxa, 328 (2), pp. 127-139, 2017, ISSN: 1179-3163. America, whereas C. brunnescens is only known from Michigan in the USA. Mycological Progress, 16 (8), pp. 811–821, 2017, ISSN: 1861-8952 . Hodophilus atropunctus is traditionally defined as the only species of this genus with dark brown or black dots on the stipe. Multi-locus phylogenetic reconstruction recognised two distinct clades morphologically corresponding to this species concept. The limited morphological description in the protologue of H. atropunctus and absence of a type specimen were limitations in an assignment of this name to one of the recognised phylogenetic species. The emended species concept and the selection of a neotype are based on careful analyses of the colour of the basidiomata and how this changes during maturation and drying. The name H. atropunctus is assigned to the paler of the two species which also shows colour change across the pileus and along the length of the stipe when dry. The second darker species is described here as new, H. variabilipes, but only seven out of 14 collections examined belonging to this taxon had distinct dark coloured dots on the stipe surface. Baltic Forestry, 23 (1), pp. 52-55, 2017, ISSN: 2029-9230. 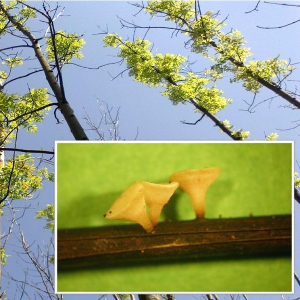 The fungus Hymenoscyphus fraxineus is responsible for dieback of common ash (Fraxinus excelsior) and in some parts of Europe also of narrow-leaved ash (F. angustifolia). The first symptoms of ash dieback have been recorded on F. excelsior in Slovakia since 2004. This study reports about the first natural occurrence of H. fraxineus on F. angustifolia in Slovakia. The field investigation was carried out in 2014. The segments of diseased shoots and last year’s petioles were collected in clonal seed orchard situated in southwest part of the country. 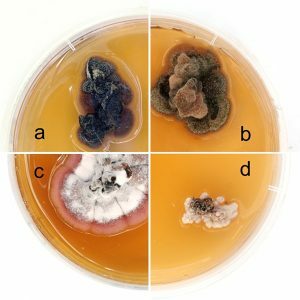 The fungus was isolated from infected host tissue and identified using molecular techniques (DNA extraction from pure cultures and apothecia, conventional PCR). European Journal of Plant Pathology, 148 (2), pp. 283-294, 2017, ISSN: 0929-1873. The occurrence and distribution of Dothistroma needle blight (DNB) on Pinus mugo was studied in 2014–2015 around the Slovakia. In total, 42 localities were investigated both native and planted ones. Symptoms of DNB were observed on 35 localities only on planted shrubs. All these 35 localities are new P. mugo DNB stands. No DNB symptoms were observed in natural and naturally regenerated plantations. DNAwas extracted from a total of 236 isolates and eight needle samples. Based on the ITS-rDNA comparisons and using species specific primers, both pathogenic Dothistroma species were detected: D. septosporum and D. pini. Isolates of D. septosporum had ITS sequences identical to D. septosporum from Europe and both mating types were identified with slight predominance of MAT2. The ratio of D. septosporum mating types varies significantly between sites, ranging from an equal proportion of each mating type to single mating type populations. D. pini ITS sequence grouped with D. pini from Ukraine, Russia and Switzerland and only MAT2 was found. Mycological Progress, 16 (1), pp. 47–62, 2016, ISSN: 1617-416X. Four European Hodophilus species with an odour similar to naphthalene, a strong unpleasant odour similar to that of mothballs, are recognized based on sequence and/or morphological data. The traditional concept defines Ho. foetens as the only Hodophilus species with a naphthalene odour in Europe. This name is now assigned to one of the studied species based on morphological examination of the holotype specimen. A recently collected specimen is proposed as the epitype. The other three species with a naphthalene odour are described here as new: Ho. pallidus, Ho. subfoetens and Ho. tenuicystidiatus. They are distinguishable in the field based on a combination of lamellae number and colour of basidiomata. All four species are grouped in the Ho. foetens superclade, one of two superclades, together with the Ho. micaceus superclade, in the genus Hodophilus. All are different species from North American taxa with a naphthalene-like odour recognised in a previous study. The Ho. foetens superclade also includes one species identified as Ho. atropunctus that does not have a distinctive odour. The type collection of Ho. albofloccipes, a recently described European species with a naphthalene odour, is placed together with some collections without a distinctive odour in the Ho. micaceus superclade. Botany, 94 (10), pp. 941-956, 2016, ISSN: 1916-2804.
genera Hygrophorus, Camarophyllopsis, or Hygrotrama, are formally transferred to Hodophilus. Biologia, 70 (5), pp. 559–564, 2015. Symptoms of ash dieback have been recorded in Slovakia since 2004. The field sampling was carried out in 2013, included 59 segments of shoots and 10 and more petioles per locality from four localities. 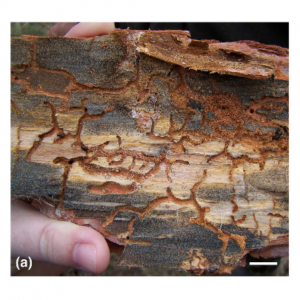 The causal agent of ash dieback, the hyphomycete Chalara fraxinea T. Kowalski, was isolated from Fraxinus excelsior L. from seven localities in Slovakia. 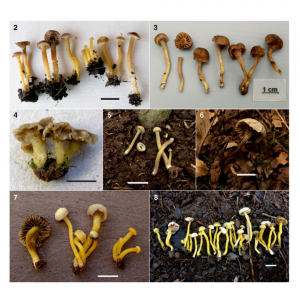 The morphology of C. fraxinea isolates and the teleomorph Hymenoscyphus fraxineus (T. Kowalski) Baral, Queloz, Hosoya are described and ITS sequences are provided. Plant Protection Science, 51 (3), pp. 141-149, 2015. 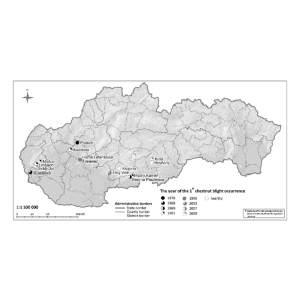 The occurrence of chestnut blight (Cryphonectria parasitica) was studied in 2011-2012 at 13 locations in the main chestnut growing areas of Romania. 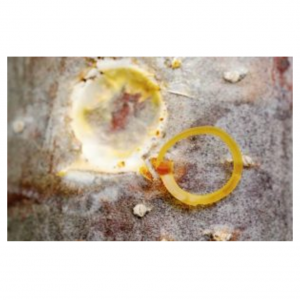 Infections were detected at four localities. 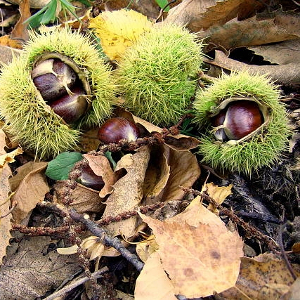 The symptoms and the fungus were detected on European chestnut (four localities) and also on oak trees (two localities). 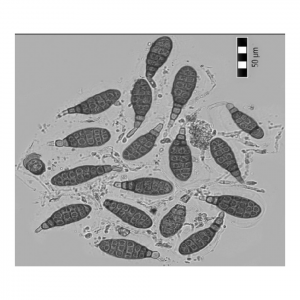 A total of 89 isolates of C. parasitica were isolated and characterised. Based on canker and isolate morphology (culture morphology and the Bavendamm test), both virulent and hypovirulent samples were isolated; hypovirulent isolates were found at only one locality. Two vegetative compatibility types corresponding to EU-12 and EU-2 were identified among isolates. Both mating types were found, with a dominance of MAT-1 in southern Romania and MAT-2 in northern Romania. 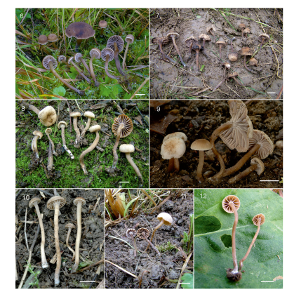 Cryptogamie, Mycologie, 35 (2), pp. 163-176, 2014, ISSN: 0181-1584. Zahradnictví : časopis profesionálních zahradníků, 13 (7), pp. 48-51, 2014, ISSN: 1213-7596. Acta Horticulturae: Proceedings of the second European congress on chestnut : Debrecen, Hungary, Baia Mare, Romania, Modry Kamen, Slovakia, October 9-12, 2013. , pp. 35-42, ISHS, 2014, ISBN: 978 94 6261 032 3. Garamond, Nitra, 2014, ISBN: 978-80-89408-18-4. Folia Oecologica, 41 (1), pp. 1-7, 2014, ISSN: 1336-5266. In 2010, 2011 and 2012 four trials were carried out to prove a reliability of the new screening method for resistance to chestnut blight caused by Cryphonectria parasitica. 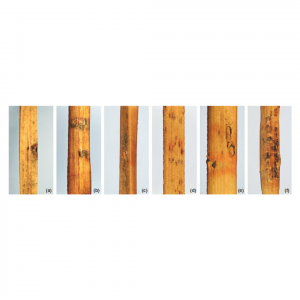 In the selected trees of hybrid origin (C. sativa × C. crenata)) 10 cm long cut-branch sections were inoculated with mycelia of three virulent isolates and one hypovirulent isolate (in two last trials) and cultivated for 7 days in the dark at 25 °C with 95% humidity. Then the bark of branch segments was peeled off and the size of necrotic lesions formed on the wood tissue around the inoculation place was measured. The size of necrotic areas varied by sampling date, type of fungus strains and tested trees. In all three summer trials necrotic lesions were larger than lesions in a spring trial of 2011, in which still dormant stem sections were used. Unlike the summer trials in the spring trial higher differences in the size of necrotic lesions among tested trees and among used virulent strains were observed. 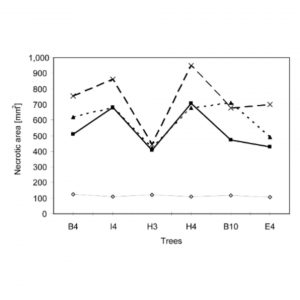 In the spring trial interactions between tested trees and fungal isolates were not so frequent like in summer trials where more trees exhibited different response to the same virulent strain. Majority of trees showed different susceptibility in particular trials. 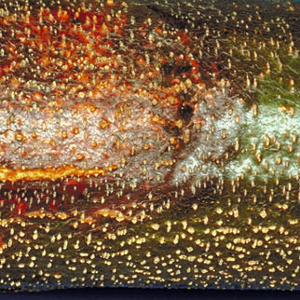 Observed high variation of reactions of tested trees to both virulent and hypovirulent isolates has pointed at the need to prove other screening methods, and to find such one, that would be highly effective to reveal an inherited resistance and/or a lower degree of susceptibility to chestnut blight. Polish Botanical Journal, 58 (2), pp. 741-746, 2013, ISSN: 1641-8180. Localities in Castanea sativa Mill. 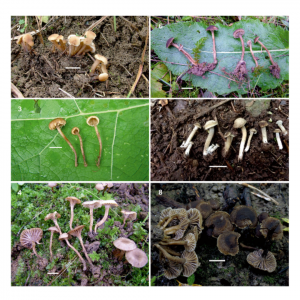 plantations were visited in a study aimed at identifying the mycoflora of C. sativa in Slovakia [excluding Cryphonectria parasitica (Murr. ), Barr for which much data is available]. Samples from chestnut tree branches and stems were examined visually and microscopically. 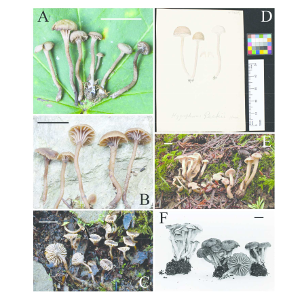 Seven species of microfungi were recorded, three with their anamorphs. Coryneum modonium (Sacc.) Griffon & Maubl. and Phomopsis castaneae Woron. were the most common. Libertella quercina Tul. & C. Tul. was identified in both states (anamorph and teleomorph) at two new localities. The records of Gloniopsis praelonga (Schwein.) Underw. & Earle and Dothidotthia celtidis (Ellis & Everh.) M. E. Barr are the first for Slovakia. These species were rare, found only in one locality. 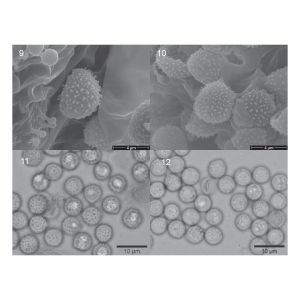 Two microscopic fungi were detected: Valsa ambiens (Pers.) Fr. [Cytospora leucosperma (Pers.) Fr.] and Diplodina castaneae Prill. & Delacr. Folia Oecologica, 40 (1), pp. 137-140, 2013, ISSN: 1336-5266.
bark. Disease symptoms and some distinctive morphological features are described in this work. Folia Oecologica, 40 (1), pp. 41-49, 2013, ISSN: 1336-5266. Central European Journal of Biology, 7 (2), pp. 267–274, 2012. The chestnut blight pathogen Cryphonectria parasitica was studied in a chestnut collection composed of both seedlings and grafts derived from selected Castanea sativa and C. sativa x C. crenata trees located in south-east Slovakia, near village Príbelce on an area of approximately 3.5 ha. The study was conducted during eight years (2003-2010). During this period 133 trees were infected, which represents 59.82% of chestnut trees of all chestnut accessions. Based on the phenotype of the fungus culture and the type of cankers in the field, all isolates were determined to be virulent. No hypovirulent strains were found. No vegetative compatibility (vc) type diversity was observed. More than 130 isolates were analyzed for vc and all were in single vc type, which was identical with EU 12. All isolates assayed for mating type were MAT-1. No perithecia were observed. No significant differences were found between the proportion of cankered and dead cankered trees in seedlings and grafts of hybrid origin (C. sativa x C. crenata) and of C. sativa origin. However, particular seedlings and grafts of hybrid origin seemed to exhibit certain resistance to chestnut blight. Garmond, Nitra, 2012, ISBN: 978-80-89408-14-6 1. Horticultural Science , 36 (2), pp. 55-60, 2009. We studied occurrence of chestnut blight disease in the Experimental Castanetarium Horne Lefantovce, SW Slovakia. The study ran in years 2006-2007 on a set consisting of 889 chestnut trees growing in the clonal orchard on Biological Plot 105. From this number, 857 trees were found healthy without disease symptoms. The chestnut blight disease was identified on 32 of them. 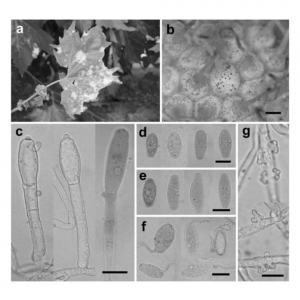 The infected trees were examined for presence of pycnidia and perithecia of the causal agent. In all positive cases, the observed morphological characters indicated virulency of the obtained isolates. No hypovirulent isolate was detected on the evaluated experimental plot. In total, six vegetative compatibility (vc) types were specified in the sample consisting of 31 isolates. Our vc types corresponded to the European vc types EU 2, EU 12, EU 13, EU 14, EU 17, EU 19. Two vc types - EU 2 and EU 19 - were dominant. Vc type EU 19 accounted 35.5% and EU 2 32.2% of isolates. The vc type EU 19, which was the most frequent one in the evaluated site, was detected in Slovakia for the first time.